crossway.bible goes to the home page of Crossway, a not-for-profit Christian ministry with a purpose of proclaiming the Gospel through publishing gospel-centered and Bible-centered content. Crossway has become one of today’s leading publishers of evangelical Christian books focused on proclaiming the gospel and applying God’s Word, having published more than 1,500 different titles, including books by Francis A. Schaeffer, Martyn Lloyd-Jones, John Piper, John MacArthur, J. I. Packer, Chuck Colson, Frank Peretti, Max Lucado, Joni Eareckson Tada, and D. A. Carson. 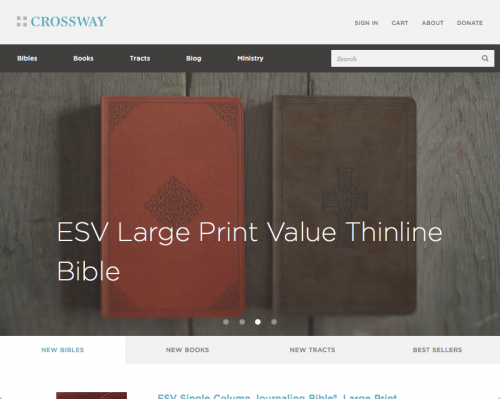 Crossway is also known for the publication of The Holy Bible, English Standard Version in 2001. The English Standard Version is a new “word-for-word” Bible translation—one that would be characterized by precision and literary excellence, in the classic stream of the Tyndale New Testament and the King James Version Bible. Crossway continues to be at the forefront of digital media and technology in Christian publishing, recognized for its ongoing mobile app development and availability worldwide. Crossway's goal for the ESV Bible is to provide it free through digital media everywhere and at any time throughout the world—free online and via every major tablet and smartphone device. Also, read the endorsement for the .bible top-level domain from Lane T. Dennis, President & CEO of Crossway.